So, you have created your YouTube channel. And uploaded your awesome videos. You constantly improve your videos. The videos you upload now are much better than the ones uploaded in the beginning. Comparing them is like you are comparing Android 6 to Android 2.3. But, you are still sad and unsatisfied. Your videos don't get the views they deserve? Even with all the hard work, time and money you invested in making your videos, your video gets a few hundred of views or even worse? And of course, that also means you’re not earning much, are you? This is because the viewers that need the content of your video can’t find it. And if they can’t find you, how are they going to watch your video? They don’t even know that you are there. You can reach those viewers by optimizing your videos for YouTube Search. 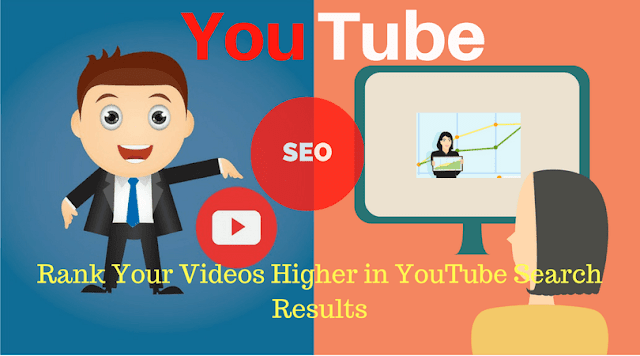 In this post, you will learn to rank your videos higher in YouTube Searches. Or you may call it “YouTube SEO”. So, Why is YouTube SEO Important? YouTube is the second largest search engine, right below Google and the largest source of videos. YouTube gets 30 million views each day. And per month, 6 billion hours of videos are watched on YouTube. 100 hours of video are uploaded every minute! With so many videos uploading per minute, how do you expect users to find your video? The competition is overwhelming. That’s why you need to rank your videos higher in YouTube search results. The greatest advantage of ranking higher is: the views you get from searches are of high quality. By high quality, I mean the viewers that want to see your video. They watch your videos longer and listen to the every word you say. Creating compelling videos is the key to getting high rank in youtube search. 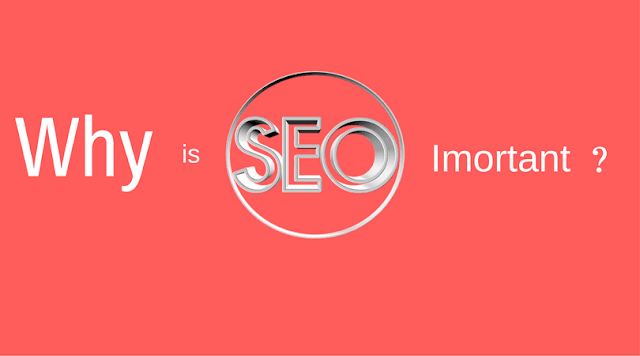 Your video is the pillar of YouTube SEO. Any kind of SEO won’t rank your video higher if users push back button just after a few seconds of watching your video. That’s right the quality of your video plays the most important role in increasing or decreasing the rank of your video. Since YouTube can’t determine whether your video is better than others in your niche, it uses different factors to figure that out. Comments: People are more likely to comment if they like your video. You can also increase keyword density by responding to the comments and including your video keywords. Thumbs up and Thumbs down: Well, this clearly tells YouTube whether your video is being liked or not. Favourite: Number of people that favourite your video or add it to their watch later playlist. How long people watch your video (retention): How long do people watch your video? The longer it is watched the better. Share: The number of people that share your video on social media sites (Twitter, Facebook, Google+, etc). People will only share your video if they like it. But sometimes they forget to share, so ask your viewers to do so in your video. Subscribers: If someone subscribes to your channel after watching your video that lets YouTube know that just how amazing your video is. Make your videos at least 5 minutes long, as longer videos tend to rank higher in search results. If your video demands you can make it longer than 5 min. Don’t be afraid that people get bored. If it’s amazing they will definitely watch it. See, how a long video ranks 1st. Well, keyword research is the first step of any kind of SEO. 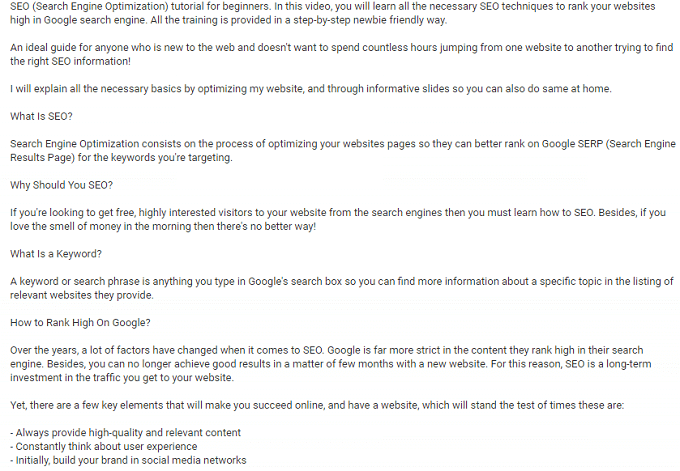 And YouTube SEO too begins with keyword research. For this, you can you use a YouTube Keyword research tool or make use of the auto-complete feature of YouTube. To find popular video keywords with YouTube; type 2-3 keywords and YouTube will automatically suggest the most popular search terms that are used with the keywords you entered. In the image, you can see that for "SEO tips" YouTube is suggesting some useful keywords. You can do this with any keyword. YouTube search suggestions for "SEO tips"
Now, select the relevant keywords that match your video niche. Your Title is that what makes users click on your video and push play. So, your title should clearly tell viewers what’s in your video. Write accurate and meaningful Title. Your Title should be long enough for viewers to understand what your video is all about. But not so long that they overlook it. As you can in the screenshot below. 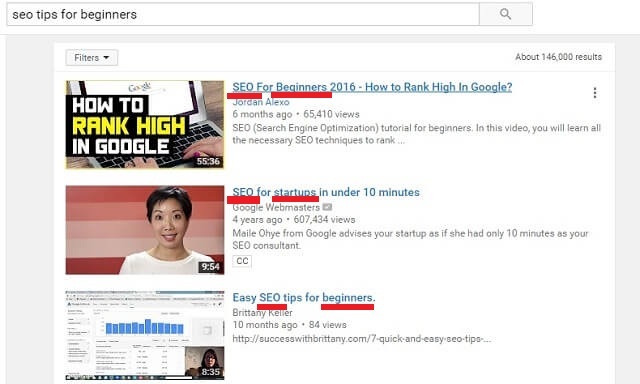 All 3 top ranking videos have "SEO" and "beginners" both included in the title and their title starts with SEO. 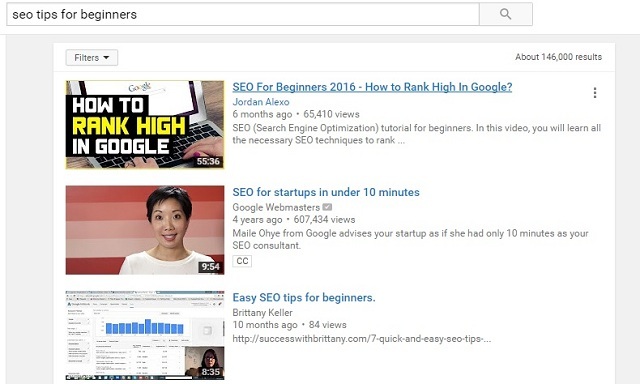 Top 3 YouTube search results for "SEO tips for beginners"
If you think your video can never rank higher than the videos of popular companies, that see the image carefully. Google Webmasters' video ranks 2nd! Description of your video helps YouTube to understand your video’s content more accurately. Add your keywords while you write the description of your video. The Description should look natural. Don’t forcefully include your keywords. Overusing Keywords (keyword stuffing) is not good for your search rank, as YouTube looks at such content as a scam. First 2-3 lines of your description are very important, make sure you include your targeted keywords in these lines (naturally). So, take time and write a long and descriptive Description, that clearly explains your video. Remember: don’t overuse your keywords; your description must look natural. It shouldn’t feel like you are stuffing your keywords in the description. How the description is written? There is no stuffing. And it's long and descriptive too. This is the kind of description you want to write for your video to rank higher. Tags are not of much importance…. … But they count. They add up to your overall keyword density and help your video to get a higher rank. Add the relevant keywords in tags and click save changes. Targeted keywords not just help YouTube understand your video’s content but they also increase the chances of you showing up in Up Next. This mostly happens when your tags match the tags of the video that someone is watching. You can add up to 500 tags (Just letting you know). You won’t get higher rank even if you fill all those 500 tags. So, just include the targeted keywords that match the content your video. 10 tags are enough. Name your video file before you upload it to YouTube. Naming your video file with your keywords also help YouTube to determine the content of your video. Your video filename should contain your targeted keywords and not self-generated names like video524.mp4, mov32.avi, etc. For example; if your video gives people 5 body building tips, then you could name your video file as ‘5 body building tips’. Embedding your video has a positive effect on your video’s search rank. Embedding shows YouTube just how popular your video is. The more places your video is embedded the higher it will rank in search results. Embed your videos in your blog post: This will instantly give your video some quality views. You can make your video around a blog post or write a blog post related to your video and embed your video in the post. Please Share your own tips that you use to rank higher. Which method worked best for you? adding keywords in the alt tag will be very effective for the ranking. Yeah! It would really help in increasing search rank. I forgot that. you can also ask viewers to subscribe your videos at the end of the video session.